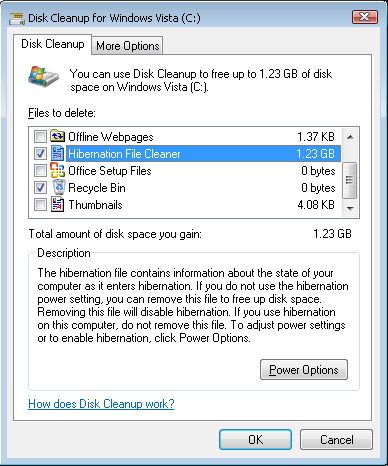 Just had this problem the other day, where not having enough space on the Vista partition to install the latest updates (.Net Framework 3.5), the Disk Cleanup wizard started and I agreed to remove the hibernation file to save some time and not having to do this again, remaining to remove some unused applications later on when the update was finished. That gave back 1.2 GB disk space and after that I managed to uninstall some more applications and compressed a few unused folders. Having enough space now and I assumed that Windows will re-create the hibernation on restart. Well, it didn't - one reboot after, it couldn't hibernate anymore. Apparently according to Microsoft KB 920730 if the hiberfil.sys is not present Vista won't hibernate anymore.